Many brides to be will favour something a bit out of the ordinary to stand proud as their wedding centerpiece. They will probably want to avoid floral or candle arrangements, preferring to look instead for some unique wedding centerpieces. The only limit to what can be chosen is really the imagination. Brides have ordered wedding centerpieces with fish, branches, feathers, apples and even coffee beans to name but a few. Below we discuss some of the unique centerpieces out there for the bride that wants something a bit different. Apples may not sound like a great wedding centerpiece but imagine a large plain coloured urn stacked with a pyramid of apples interspersed with peonies. Or how about a large, white, oval bowl brimming with orange fruits such as clementines and kumquats combined with green leaves and small white flowers? Place small white sugar bowls filled with orange sweets around the large display. For simpler wedding fruit centerpieces either fill some cuboid glass vases with whole lemons or limes and stand a tall flower through the middle or fill these vases with water and add sliced lemons, oranges or grapes. Again top with flower heads of long stem flowers – it may not sound stunning but have a practice run and see what you think. 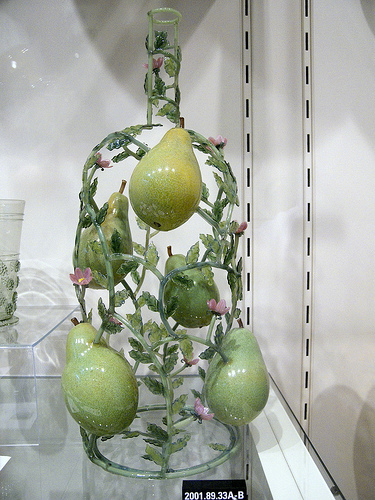 There are many unusual containers that could be used as the basis for a unique centerpiece. Consider decorating a bird cage, a lantern, a jug or a goldfish bowl or using mirrored tiles as stands for candles or colored stone filled glasses surrounded by tealights. Why not kill two birds with one stone and use your wedding favors as the table centerpieces? Glass vases filled with old fashioned sweets, tiered cake stands with gourmet chocolates or small bags containing the favors hung from a candelabrum would all work as stunning and practical displays. 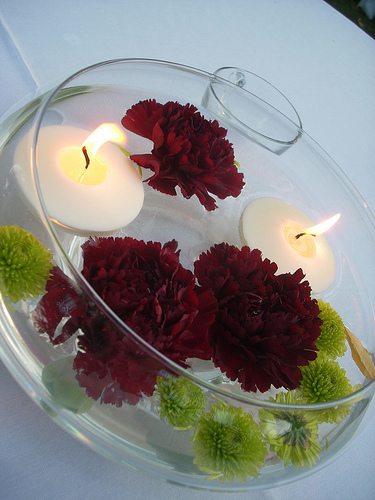 Bowls of water with either floating flower petals, flower heads, candles or glass stones are increasing in popularity. The bowls can be chosen either in small sizes where you have a few on the table or large bowl type vases where one is used as the focal point. They can be quite stunning and either purchased or hired quite cheaply. Many weddings are themed around something interesting to the bride and groom, the time of year or a color, such as the beach, Christmas or a hobby. If you need themed wedding centerpieces to tie in with the topic of the day, you could perhaps consider a shell filled vase with a paper cocktail parasol for a beach theme, a mini decorated Christmas tree for the seasonal theme or tall candlesticks topped with a mini racing car surrounded at the bottom with chequered flags for a racing car theme. And if you are into Grand Prix, why not extend your themed wedding by honeymooning at one of the many Silverstone Hotels – the home of British motor racing? If there will be children attending the wedding reception, it is sometimes a good idea to seat them all together on their own table so they can amuse each other. If this is the case, a standard wedding table centerpiece may not be ideal. Instead why not consider covering the table with white paper and fill a related center piece, such as a vase, with colouring pens and pencils. This will give the children a creative outlet and the bride and groom a lasting memory of their younger guests. With so many alternatives these days to traditional flower and candle wedding centerpieces, you should not be stuck for ideas.